Inspired by a love for New York State maple syrup. Catskill Provisions has raised the bar in the world of pancake mixes. Organic, traceable wheat is grown and milled in New York and is lovingly placed by hand in to each and every bag. Each package contains tried and true recipes for pancakes, waffles and blinis. 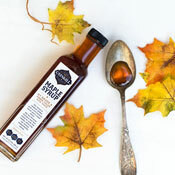 Drizzle with Catskill Provisions New York State maple syrup for a delicious way to start the day!